WHEN Edward was told what his uncle had done, he was very sad and very much afraid. "Oh," he said, "I hope my uncle will not take my life as he has taken my kingdom." From that day he became sorrowful, and did not seem to care about anything. He did not even trouble to dress himself properly. Richard took away all the little Princes' servants and left them only one man, called Black Bill. He was rough and rude, but even he loved the gentle little boys and tried to comfort them, for, shut up in one room with nothing to do, the days seemed very long and dreary. But although Richard was King, he could not be happy. 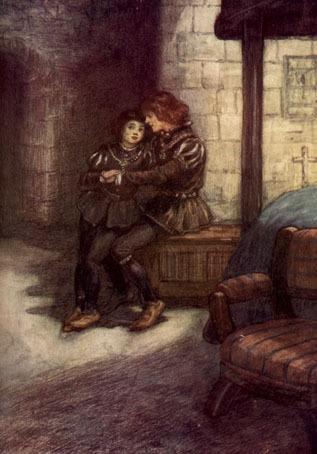 He could not forget the little Princes in the Tower. As long as they lived, he knew that some day the people might drag him from the throne and make one of them King instead. So he determined to kill Edward and his brother. King Richard sent a message to the Governor of the Tower telling him to kill the Princes. But the Governor refused to do the wicked deed. Richard, however, could always find men bad enough to do what he wanted. He sent a bad man now to the Governor of the Tower, commanding him to give up the keys of the Tower for one night. The Governor was forced to obey the King, but he did so with a sad heart. That night the little Princes went to sleep with their arms round each other's necks, each trying to comfort the other. They lay together in a great big bed, happy in their dreams with tears still wet upon their cheeks. As they slept two men crept softly, softly up the dark stair. Quietly they opened the door and stole into the room. They stood beside the bed, hardly daring to look at the two pretty children in case the sight might soften even their hard hearts, and they would be unable to do the cruel deed. Then they seized the clothes and the pillows and pressed them over the faces of the little boys. They could not scream, they could not breathe. Soon they lay still, smothered in their sleep. Then the wicked men took the bodies of the two little Princes, threw them into a hole which they had made under the staircase, covered them over and fled away. There the bodies were found many years later. Now that Richard had murdered the rightful King and his brother, he was no happier. Terrible dreams came to him at night so that he could not sleep. By day he thought that people were even ready to kill him, and his hand was almost always on his dagger. The people hated him and he knew no rest nor peace. He tried to make good laws so that the people might forget his wickedness. But it was no use. They hated him in spite of all he could do. Plots against Richard soon began. Even the Duke of Buckingham, who had helped him in his wickedness, and put him on the throne, turned against him. The people longed for another King, and their thoughts went out to Henry Tudor, Duke of Richmond. You remember that Queen Catherine, the widow of King Henry V., married a Welsh gentleman called Owen Tudor. This Henry Tudor was her grandson and he was also descended from John of Gaunt. He belonged to the House of Lancaster and had fought for the Red Rose. Henry of Richmond was at this time living in France, but he now gathered an army and came over to England. But before he came Richard had already fought the Duke of Buckingham. He defeated him, took him prisoner, and then cut off his head. When Henry heard that, he went away again. But he soon came back. This time as soon as Henry landed, people flocked to him. Noble after noble deserted Richard and joined the Red Rose party. In 1485 A.D. a great battle was fought called the Battle of Bosworth Field. This was the last of the Wars of the Roses, and in it King Richard was killed. He fought well, for, although he was small and deformed, he could fight. His horse was killed under him, but he still fought on foot. In the middle of the battle Lord Stanley left the King, and, with all his followers, joined Henry Tudor. Seeing that the battle was lost, some of his nobles begged Richard to fly, but he would not. "I will die a King," he said, and so he fell in the thickest of the fight. As he fell, the crown which he had worn over his helmet rolled away under a hawthorn tree. There it was found by Lord Stanley who set it upon Henry's Tudor's head and, on the battle-field with the dead and dying round, the soldiers shouted, "King Henry! King Henry! Long live King Henry!" The place is still called Crown Hill to this day. Richard III. had reigned two years, two months and one day. "And it was twenty-six months and twenty-four hours too long," said a man who lived about that time, and who tells his story.